Looking to use the Samsung Galaxy S8 or Note8 as a flashlight? Here’s where it’s found. From the Home screen, swipe downward from the top of the screen with two fingers. The “Flashlight” option is revealed. Tap it to enable the camera flash to act as a flashlight. Tap it again to turn it off. Hold down the Bixby button and ask it to turn on the flashlight. You can also turn it off the same way. Can I access the flashlight feature from an icon or widget? A third-party option from the app store would be required for that. You can add the flashlight option to the main row of the quick menu though. Just swipe down with two fingers again then select “Edit”. From there, tap and hold “Flashlight” and drag it to the top row, then tap “Done”. The option will then be available by swiping with only one finger from the top. My Note 8 does not have that option on the pull-down nor does it have the Wi-Fi or the Bluetooth like yours does is there a way to fix this? I answered that question in the FAQ section of the post. You’ll need to download a third-party flashlight app for that. 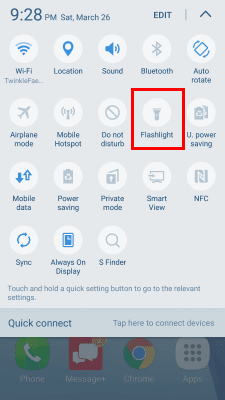 Is there a way to put the flashlight from the top screen on phone where settings are, to the home screen pages. I use to have an app that lets me just tap the app once it’s downloaded and automatically the flashlight turns on. All others I tried the app opens and u have to turn the light on that way. Thanks for taking time to read this.